On the latest episode of WWE Raw, the official women’s Elimination Chamber 2018 participants were announced by General Manager Kurt Angle. Surprisingly, one major women’s superstar was left out of the match. However, Alexa Bliss learned of the five women that she’ll have to defend her Raw Women’s Championship against inside the “Chamber.” Here are the latest details on which women’s superstars will fill those five spots and why one particular superstar wasn’t included. As reported by ProWrestling.net on Monday night, the Raw episode was held in Des Moines, Iowa. Raw GM Kurt Angle announced the five other women who will step inside the Elimination Chamber. The current Raw Women’s Champion Alexa Bliss will defend against Bayley, Sasha Banks, Mickie James, Mandy Rose, and Sonya Deville. After the announcement had been made, the current champion got a bit heated at the fact that she was being made to defend her title at the pay-per-view, while the top men’s champion, Brock Lesnar, was not. However, Angle reminded “Miss Bliss” that she has not defended her title since October. A poll of the fans in the crowd also revealed that they want to see Bliss defending her title at the upcoming event. As far as her opponents, Asuka is obviously missing due to her win in the women’s Royal Rumble match. That gives her a title shot at WrestleMania 34 against either the Raw or SmackDown Live Women’s Champion. However, another women’s superstar who wasn’t named as part of the first-ever women’s Chamber match was Nia Jax. 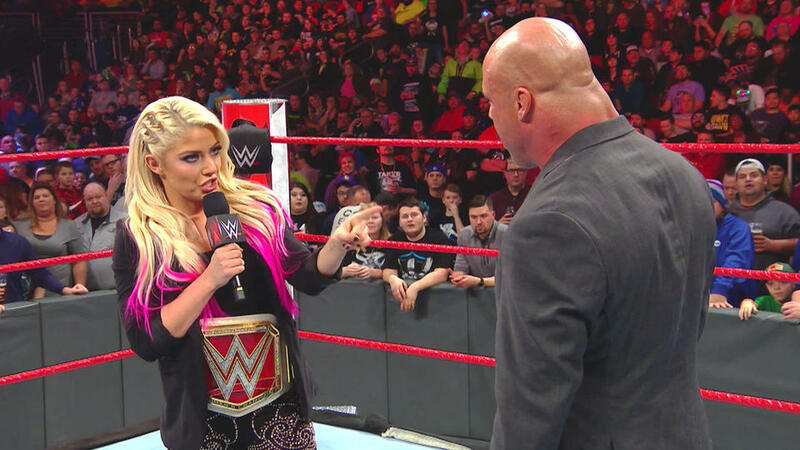 Kurt Angle indicated that Nia will take on Asuka at the Elimination Chamber 2018 pay-per-view in a singles match. The stipulation is that if Nia defeats Asuka, she and Asuka will take on the Raw Women’s Champion in a Triple Threat match at Mania. That presents an intriguing situation as Asuka hasn’t lost in forever. There have been lingering WWE rumors (or spoilers) that Asuka is going to challenge SmackDown Live Women’s Champion Charlotte Flair at WrestleMania while Nia will take on Bliss one-on-one. However, is it possible that WWE might be heading a different direction with the women’s title pictures? There had been ongoing rumors that UFC star Ronda Rousey was going to challenge Charlotte Flair at Mania so if WWE is planning for that, then a Triple Threat match makes sense. Still, it would also mean a surprising first loss for Asuka at the PPV. That loss could make sense, though, as it would make Asuka look “beatable” heading into the huge title match at WrestleMania 34. It would put the notion out there for fans that an unstoppable Nia Jax is destined to win the title and Asuka (or Alexa) would need to conquer her to capture the women’s title. The WWE’s Elimination Chamber 2018 pay-per-view is scheduled for Sunday, February 28.